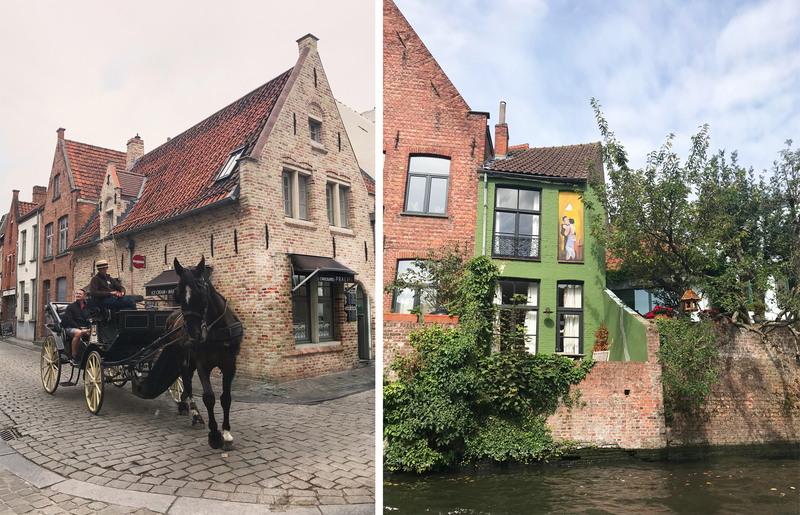 Beautiful, fairy tale and underrated Bruges (or Brugge if you are from there!) has quickly become my favourite city. I recently went there and honestly feel like I’ve come back from a real life Disney movie. 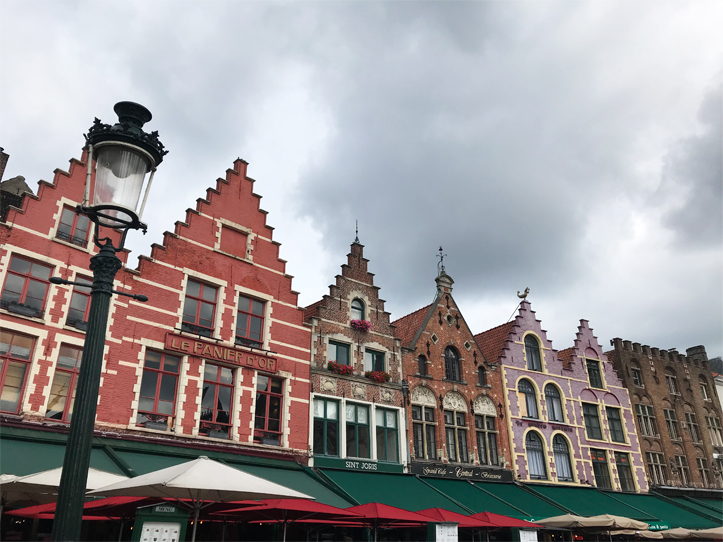 After spending a brief night in Brussels, I spent all of Saturday and Sunday in Bruges before getting the train back to Brussels late afternoon on that Sunday. I think a weekend is the perfect amount of time to spend in this town. It becomes crowded with tourists from tour buses around 1pm so it was nice to have a stroll around the village before people woke up. From Brussels Central (or Midi) you can hop on the train for as little as €15,80 with an open return. We booked this ticket on the day and the train takes around 1 hour and 10 minutes. 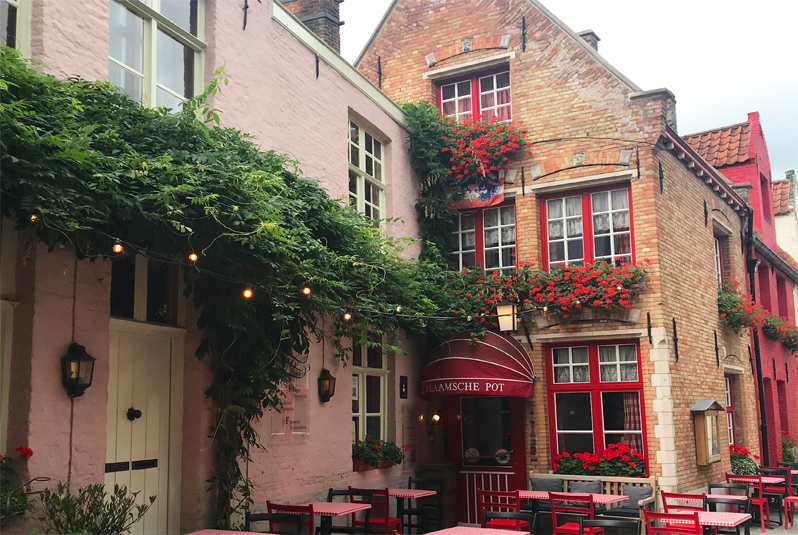 I stayed in NH Bruges for that one night and it was in the most perfect location (5 minutes walk from the centre) and felt very authentic. What I loved most about this town was that it was truly an artistic mix between old and new and hopefully that shows in my photos. 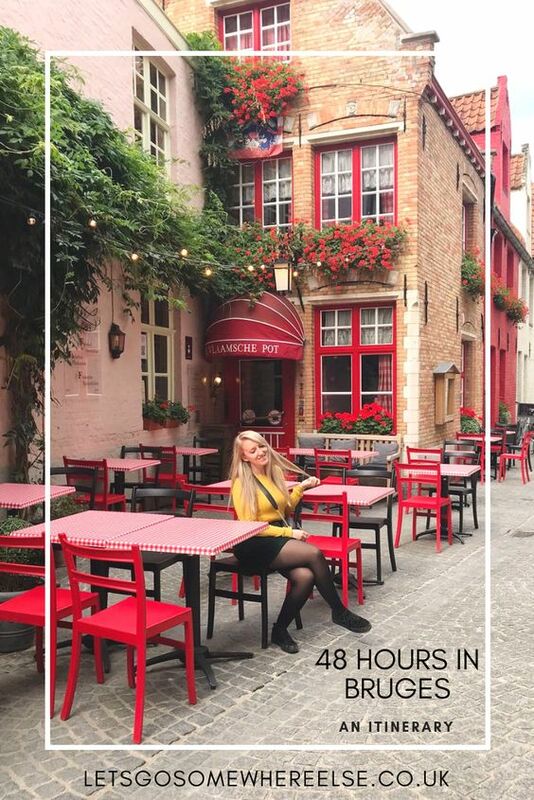 My friend Marcela put together an entire itinerary of this trip (she appears later in my photos) so I have her to credit! We did do some spontaneous things as well, but restaurants and timing was down to her. Our first stop of the day after dropping our suitcases off. A quirky little breakfast/brunch place which was packed when we arrived (around 10.30/11.00ish) but we waited no longer than 5 minutes for a space. We got super lucky and even had a table outdoors. I decided to go all out and have a Soy, Ice Latte with brownie syrup and a cheese toasty (yes, I am that girl, but only because I have to be. That’s for another post!) A great little place which I highly recommend and they cater to ALL diet types with the cost being on the cheap side too. 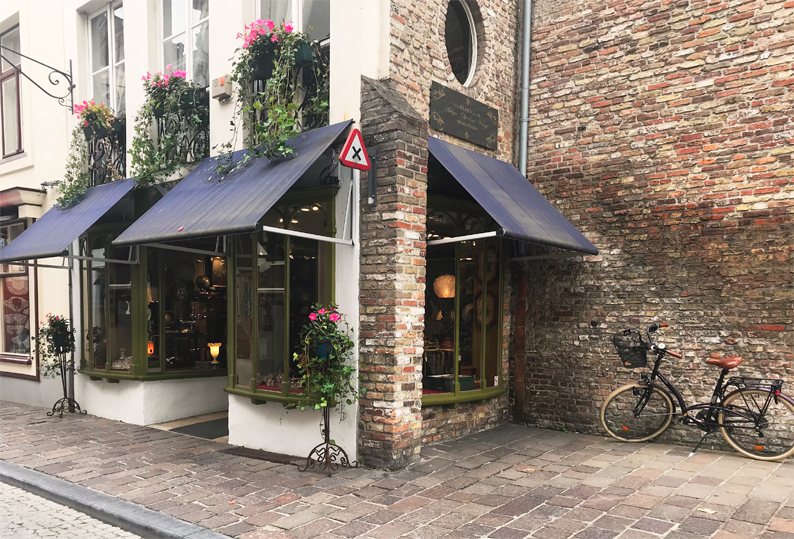 Next up was a little stroll around the streets to walk off our breakfast but the main goal was to get to the Markt and the Belfry of Bruges. We were going to climb the Belfry to see the view but we were too stuffed from breakfast (both days) to climb over 200 steps! There was also a queue and we decided it just wasn’t worth it. 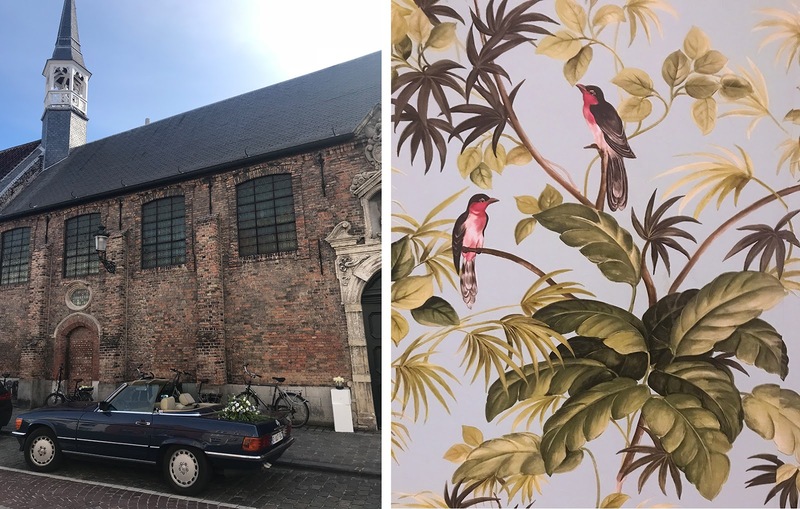 We ended up hanging around the Markt for a little bit, taking some pictures and soaking up the atmosphere. It kind of reminded me of a smaller scale (and better) version of Grand Palace in Brussels. 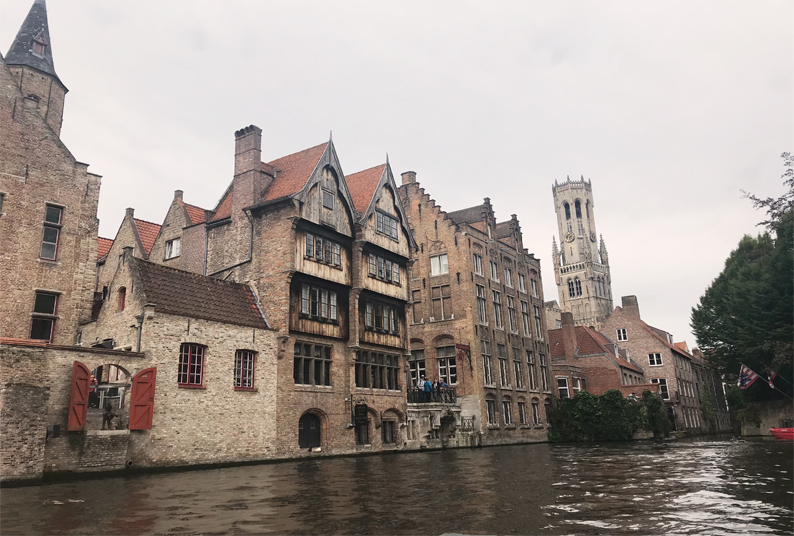 After exiting the Markt we stumbled across a little boat cruise tour. This was €8 per person and a short wait despite what the queue looked like. The boat departs around every 10 minutes and can take around 25 people. This was a beautiful unique way to see the city, as the boats are low enough (but safe) for you to touch the water. I really recommend it and it is a decent price! I think the tour was around 30 minutes-45 minutes. Do it, even if someones bald head blocks a third of your view (source: experience). 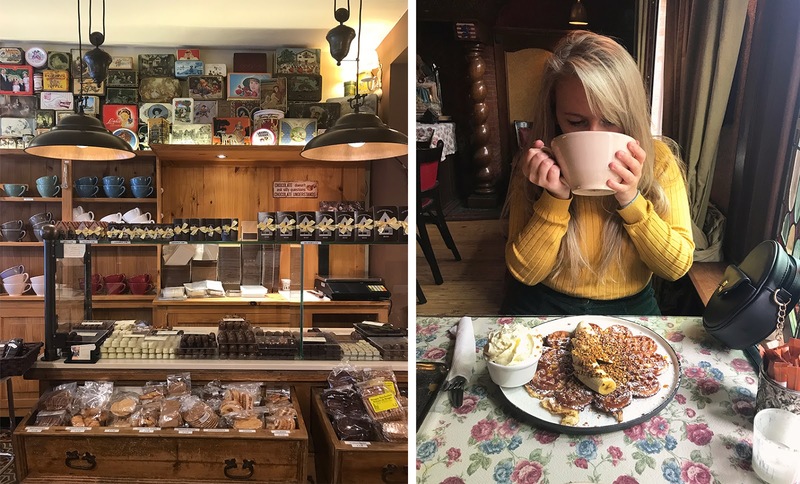 Despite a few hours passing at this point, exploring shops and the surroundings, we decided it would be a good idea to visit the Old Chocolate House even though we were still full from breakfast! With a shop downstairs and a little tea room upstairs, we ordered hot chocolates bigger than our faces and banana waffles. Just to, y’know… get the full Belgium experience. It was really lovely in there and I am not usually a fan of hot drinks but I ordered the Salted Caramel hot chocolate which came in a cupcake case and dipped it in my heated soy milk. Let me tell you, it was SO good. They had a little trouble understanding why I would want to order normal hot chocolate pieces with soy milk and there was some miscommunication but we got there in the end. I think they just wanted to be thorough in case I was allergic which is completely understandable and something which makes me happy to see! We managed to get a window seat and a marching band came past while we were eating, it was a truly magical experience. The rest of the day was spent with more eating and exploring. Even stumbling in to an art exhibition. We went back to our hotel around 6.30pm, checked in, had a little nap, went out for dinner and then had an early night. In that order. I know, I am truly wild!! But I think it is better to be honest in a blog than lie to you and said I was non stop for 24 hours. Departure day! We were leaving around 4pm so we woke up extra early to explore while there were no tourists and even visited a few museums. 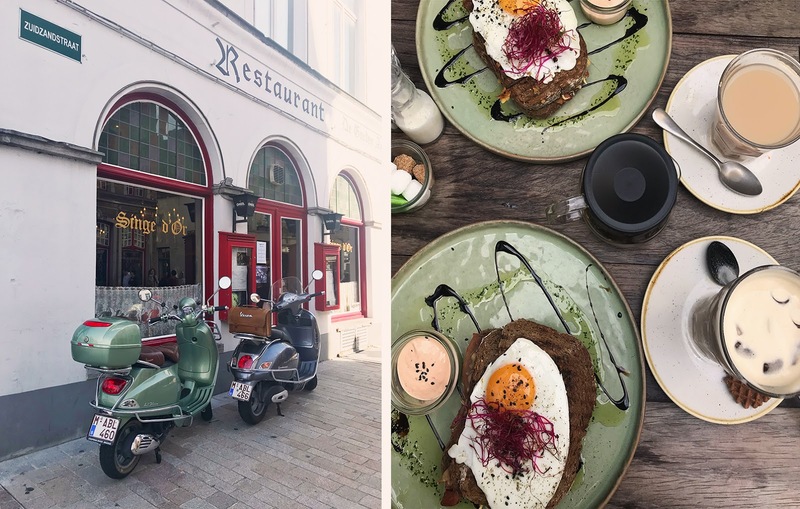 We stopped off in Sanseveria, the bagel breakfast restaurant! One of my favourite things about Europe is these quirky individual places that they actually give you fresh orange juice. It makes such a difference and gives them bonus points in my book :)haha! We ended up sitting at the communal table and I was kind of shy to take photos in front of people, so I don’t have any from that place however I thoroughly recommend checking them out online. The bagel was delicious! After walking a little more, we went to the Fries Museum and the Chocolate Museum. We bought a combo ticket which I think was €12 or slightly more. I didn’t take many photos in these because frankly, who wants a bright yellow fry with eyelashes on it on their blog? Both museums were fun to visit and to kill some time. 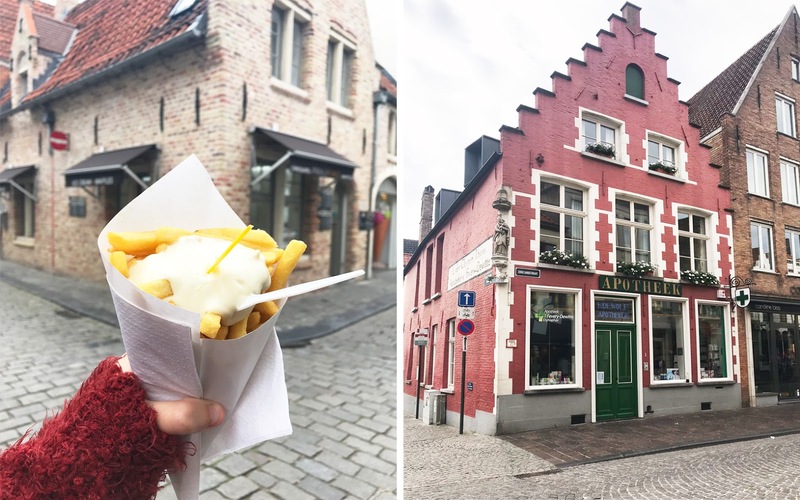 There is a fries restaurant at the bottom of the fries museum, which you can use your €2 coupon that you receive at the start. As for the chocolate museum, there is a free sample when you walk in, as well as chocolate dispensers throughout and a workshop at the end. They’re both worth visiting for these reasons alone to be honest, haha. After all this walking, exploring and site seeing we soon realised that we actually had not sat down and even tried the beer. 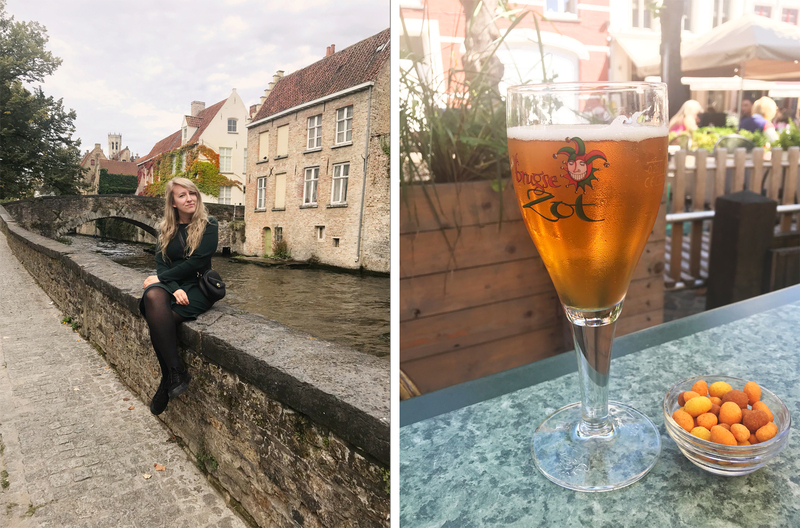 We went back to a little square closer to our hotel and they had the traditional Brugse Zot beer for just €4 (and free peanuts) which was the perfect end to our little trip. Shortly after, we collected our bags from the hotel and took a train back to Brussels. 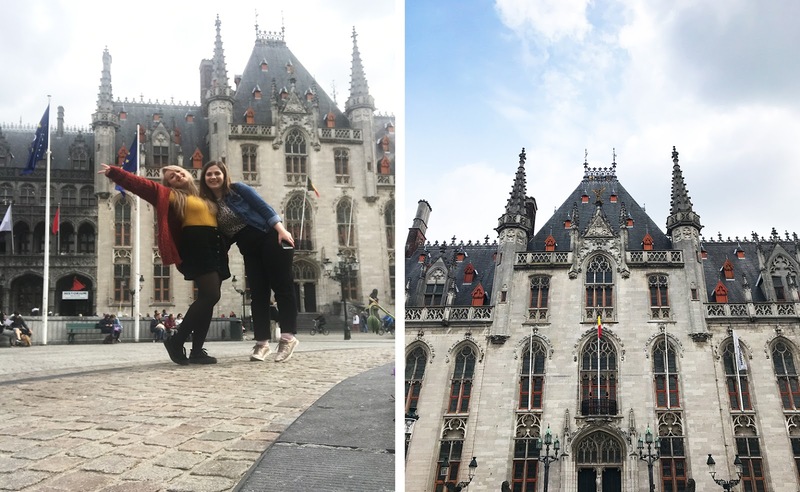 We spent around 3/4 hours there while waiting for our Eurostar home and experienced the beer festival, a dog in sunglasses and the absolute madness that is Manneken Pis (oh and more waffles). 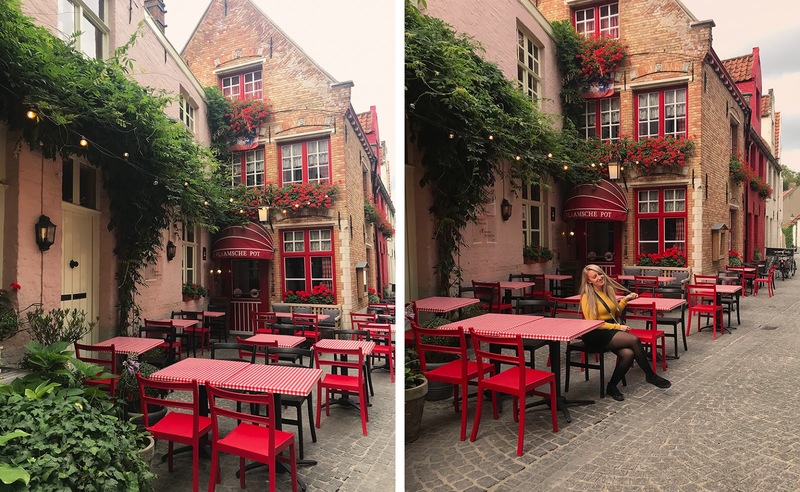 I hope you enjoyed my little post on Bruges/Brugge and I managed to capture how beautiful it really is. 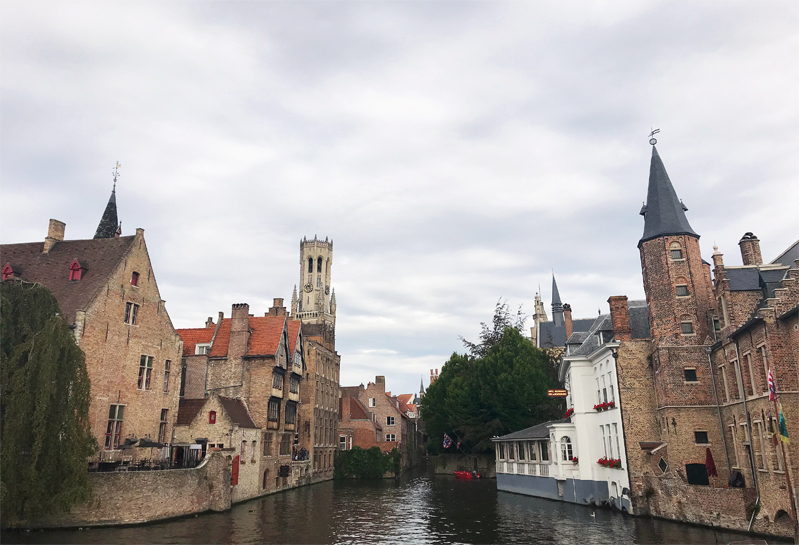 I would recommend for people of all ages to just go and check out Bruges if you have time. Maybe on a day trip from somewhere like Amsterdam or Brussels? Let me know if you’ve been! I would love to hear if I missed anything. "PARIS: 8 THINGS NOT TO DO"
"TRAVEL FASHION ON A BUDGET"
Thanks for the comment Nicola! I also love it too and would love to go back! Perhaps in the snow?? It would be picture perfect! I’m looking at maybe visiting Bruges at a weekend after work on a Friday! The boat ride looks like a great thing to do, and I absolutely love Belgian beer so this would be a must!